Manuscript Document, 8” x 8 ¼”, in an unidentified hand, March 21 & 22, 1776. 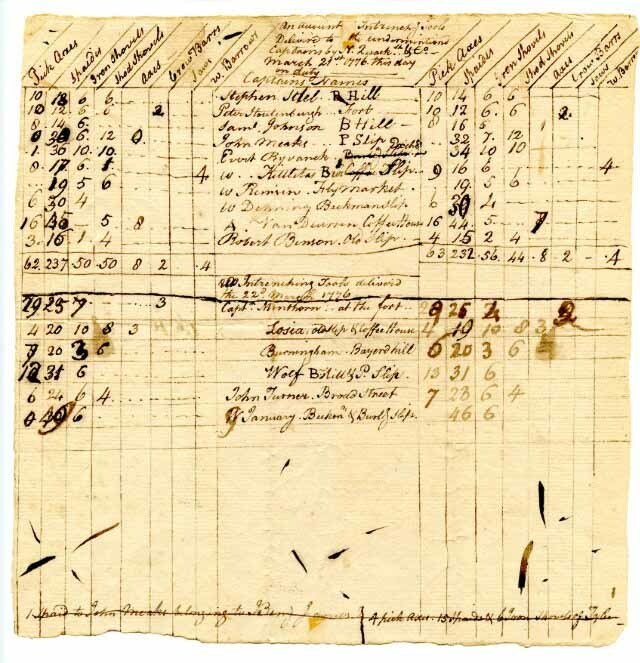 An historically important return for hardware issued in preparing the defenses of New York City just a month before the arrival of General Washington, quantities of tools being dispensed by Quartermaster Nicholas Quackenbush, “Pick Axes, Spaides, Iron Shovels, Shod Shovels, Crow Barrs, Saws, and W[heel] Barrows,” are listed at left and right. Captioned at center, “On Account, Intrenching Tools delivered to the undermention[e]d Captains by N[icholas] Quack[enbu]sh…March 21st 1776, this day on duty,” and similarly entitled at mid-page for the following day, the commanders and locations in lower Manhattan for which the hardware is provided being enumerated below. After the year-long Siege of Boston forced the British to evacuate in March 1776, they turned their attention to New York City. Work on that city’s fortifications - virtually non-existent at the time – was begun by Continental Army General Charles Lee, who arrived in the ill-prepared city by order of General George Washington in late January 1776. Concerned for an uprising of the city’s sizable loyalist population and fearing bombardment by British warships in New York Harbor, Washington arrived and took command of the American forces in early April, just days after the accomplishment of this document. As expected, the warship HMS Asia arrived in New York Harbor on May 27, with another one hundred thirty ships from the British fleet soon to follow. The stage was set for the battles of Brooklyn Heights, Harlem Heights, White Plains, and Fort Washington. The city was evacuated in mid-November, and remained in British hands for the remainder of the war. The document is lightly and evenly toned, with the expected folds and minor stains, and the bottom edge is somewhat irregular.